Western blot analysis of whole cell lysates probed with ILK1 antibody followed by detection with HRP conjugated Goat anti Mouse IgG (1/10,000, STAR207P) and visualized on the ChemiDoc MP with 47 second exposure. Arrow points to ILK1 (molecular weight 50 kDa). ILK1 antibody recognizes ILK1, also known as p59, integrin linked kinase or 59 kDa serine/threonine-protein kinase. Mouse anti Human ILK1 antibody recognizes ILK1, also known as p59, integrin linked kinase or 59 kDa serine/threonine-protein kinase. This gene encodes a protein with a kinase-like domain and four ankyrin-like repeats. The encoded protein associates at the cell membrane with the cytoplasmic domain of beta integrins, where it regulates integrin-mediated signal transduction. Activity of this protein is important in the epithelial to mesenchymal transition, and over-expression of this gene is implicated in tumor growth and metastasis. Alternative splicing results in multiple transcript variants (provided by RefSeq, Jun 2013). 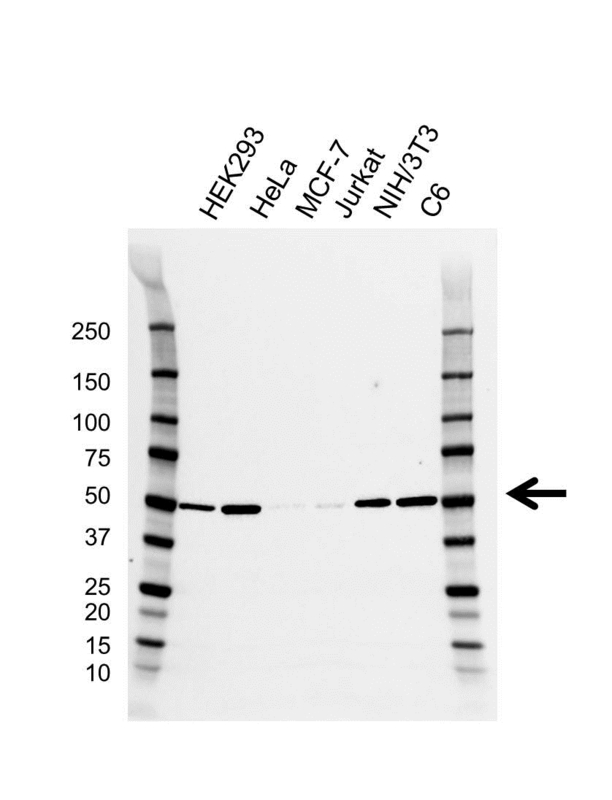 Mouse anti Human ILK1 antibody detects a band of 50 kDa. The antibody has been extensively validated for western blotting using whole cell lysates.